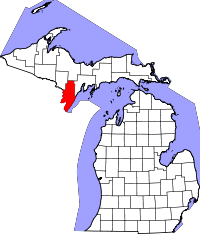 Menominee County, named after a Native American word meaning "wild rice eater," offers traditional vital records with varying dates of availability, along with other records, such as naturalization (available from 1863 to the 1940s), and others. Birth records, which only become part of the public record when older than 100 years old, are listed beginning in 1863 to the present, however births in the county were limited prior to 1973 due to the nearest hospital capable of deliveries being located in another county. Death records are listed from 1860 to the present. Marriage records begin in 1867 and continue to the present, and the exact time period divorce records began is unknown, though they also continue to the present. The Clerk's office, located in the Menominee County Courthouse in the town of Menominee, allows only four individuals to engage in research at once. A Vital Records Request Form is provided on the County Clerk's website. Note: Fax number is for entire courthouse; be sure to attach a cover sheet with specifics.